Other Accessories: Mud-flaps, bell, rear carrier, rear light, dynamo. 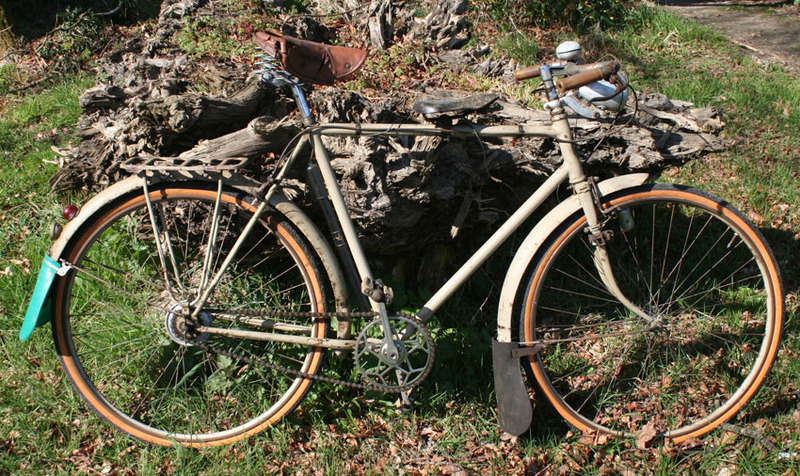 This is a very attractive French bicycle, with some nice detail touches. The saddle is torn. I’ve not serviced it, so I’d recommend greasing it up and replacing the tyres before using it. The child seat and footpegs (mounted on the front forks) are interesting period accessories. This bicycle is being sold ‘as is’ because I have far too many restorations on the go at the moment. As you can see from the photos, it is a very sound bike in totally original condition. There is surface rust on the paintwork. The frame is solid. Britain – delivery is £40 for a bicycle to main parts of England; extra to Scotland, Wales, Cornwall, etc. I use a private company that collects when he’s in my area and drops when he’s in yours. It may take around 2 weeks to deliver. INTERNATIONAL DELIVERY: I CAN PACK THIS BICYCLE AND SEND IT BY COURIER SERVICE INTERNATIONALLY. Europe, Ireland, NI costs £120. South Amercia, Australasia, Japan, Asia, etc £250. PAYMENT: Paypal, cheque, bank transfer. International purchasers – Please email me to discuss payment and shipping options.